Last night was another doozy of a night. It all started about a month ago on my local poultry swap list when a friend posted about a coop that she'd found on Craigslist. A 4x8 foot (possibly mobile) coop for $60? I'm all over that! Well, I sent an email and never heard anything back, so I assumed it had been sold. All of a sudden, I got an email this Tuesday that apologized because my message had gone to their SPAM folder and they hadn't noticed it. Was I still interested? It had to be gone by Friday. OF COURSE! Hubby at first said OK, until he noticed that it was 2 hours away. Then he started to balk. He insisted that he could build a coop for me for less. Now remember, my darling lovely Yokohamas have been living in a large dog crate RIGHT UNDER our bedroom window for about 3 weeks now. I still adore them, but the crowing at 3 AM is starting to grate on my nerves. I told him that, not only would he have to have it done THIS WEEKEND but that I wanted upgrades to the design (welded wire instead of chicken wire to keep the raccoons and possums out, handles, wheels, etc.). He finally sighed and said "Call her. We'll go get it." I do love that man! The next day produced a mad scramble to clean my truck, arrange to borrow Ralph's trailer (and, as it turns out, truck too, since his taillight hookup didn't match mine), pick Caitlin up from school instead of waiting for the bus to get here, get both kids back home and through the bathroom, transfer the car seats, and take off like the devil was on our tail. We had about 2 hours' drive each way, and daylight was ticking away. Folks, there's a reason that we usually plan road trips for after dark when the kids are asleep. They're great kids, don't get me wrong. They USUALLY get along. But when they don't . . .oh boy, hold on to your hat. Yesterday was one of those days. I was grinding my teeth so hard I could have created enough kinetic energy to power the truck. Well, we finally got there. Sue was SUCH a nice lady. She even had kids fairly close in age to mine that didn't mind playing and sharing their toys with my hooligans while we loaded the coop. That sounds so easy, doesn't it? She DID tell me to bring 4 extra people, but after looking at this picture, I figured that it couldn't be THAT heavy, could it? Um, yes, yes it was. I didn't help any by leaving hubby's drill and the equipment he'd gotten together to help move it in my truck, which was back at Ralph's. 2 hours away. ACK. We also were trying to do this in falling dusk and maneuvering over composted hay. Still, after all the pushing, pulling, and poking we did, this thing was solid as a rock, construction-wise. Thank GOD Sue was there to help. With Scott (his muscles and some straps) at the front, and her and me at the back, we finally got it moved up onto the trailer. Again, THANK GOD the trailer had a ramp. I'm so glad the kids played well together. (Mind you, Sue has 2 of the cutest kids to grace the earth!) I was also beyond tickled to get some bales of sprouting hay. Yeah, I know that sounds gross, but the chickies will love it and it'll make us some great compost. So we got home way too late last night. Blessed man that he is, Scott not only carried the kids up to bed, but unhitched the trailer so I could gas up Ralph's truck this morning and get it back to him in time for him to run into town for lunch. I fully expect that we'll have even more adventures unloading it, so be on the lookout. 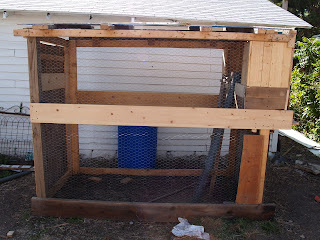 I plan to add some hail screen, wheels, and paint--this will be a complete Tour de Coop when I'm done with it. Thanks, Sue, for building a solid chicken pen and giving us a great deal. Thanks, Ralph, for loaning us your truck and trailer. Thanks, Scott, for not only letting me get a new coop, but putting so much time and sweat into it. Thanks, kids, for not making me pull over to the side of the road to strangle both of you. Thanks, readers, for taking an interest (and hopefully getting a chuckle or two) in my blog. Tie Dye For: The Final Chapter . . .or is it?